Mona Barrie (formerly Mona Barlee) in MGM’s “Cairo”. It’s hard to accept Mona as a wicked Nazi spy while she wears this extraordinary hat! This is a convoluted 1942 spy film with music, comedy and drama, featuring robot bombers and doors in pyramids that open with the sound of a “high C”. But she was firmly established as a screen actor and had been at work in Hollywood for eight years, and before that for eleven years in Australia. Photo – probably from MGM. Author’s Collection. Like most other Australians wanting to work in the US at the time, Mona Barrie (then Barlee) arrived in California on the Matson liner Monterey in June 1933, to pursue her dream. Her career took off remarkably quickly and for the next fifteen years she was busy in Hollywood, in more than 40 films, of varying quality. For various reasons she developed nothing like the profile of her contemporaries Mary Maguire or Constance Worth and yet, her movie career was, by any measure, much more successful. She even has a star on the Hollywood Walk of Fame. Mona Barrie in Hollywood. Over time she developed a reputation for glamorous and fashionable attire. This Fox Films photo was taken in 1935. Author’s collection. The oft-repeated story that soon after arriving in the US she went to New York to stay with a friend appears to be true. Mona had enjoyed a successful career on stage in Australia and had met US performer Florrie Le Vere and her songwriter husband Lou Handman during their 1928 tour. The two women had struck up a friendship. Mona had traveled to stay with them at their apartment on Riverside Drive, New York. It was claimed she got her film start “by accident.” The Adelaide News wrote “She was on her way to London and passed through Hollywood. Three talent scouts saw her and begged her to have a screen test. She accepted, had a test, and signed a contract.” This was the usual “rags to riches” fame story then so popular. A report by Melbourne’s Table Talk, in November 1933, told a similar story. It claimed she had been offered a screen test by a Fox Film scout, “Mr Solomon Pinkus” having been spotted on a New York bus. She had been on her way to London. This story would be more believable if it wasn’t very similar to the one Constance Worth and Mary Maguire would wheel out as well. But, perhaps it was they who were copying Mona’s experience. Mona, centre, as one of “nine pretty girls who adorn the production (of The Merry Widow) at Her Majesty’s.” This appears to be Mona’s first outing on the stage. Table Talk, 12 October 1922. Via National Library of Australia’s Trove. Born in Tooting, England, a southern suburb of London, in 1906, Mona Barlee Smith and her three siblings and mother Jessie Barlee, had arrived in Australia in 1914. Her father Phil Smith had arrived courtesy a J.C. Williamson’s contract a year before. Unfortunately, like the stories of her start in film, Mona’s Australian story is badly muddled in online accounts – these are not only confused about her date of birth but also her date of arrival in Australia. Perhaps she contributed to this confusion herself in later years. But there’s not much doubt around her real date of birth. Although often claimed to have been born in 1909, we can confidently say she was born in 1906. She was 5 years old during the 1911 English census, and 8 in April 1914 when she arrived in Melbourne. Not only that, we can find the index entry for her British birth – it also states 1906. Left: 1911 English census, when the family lived at 37 Malvern Rd, Surbiton, Surrey, lists 5-year-old Mona. 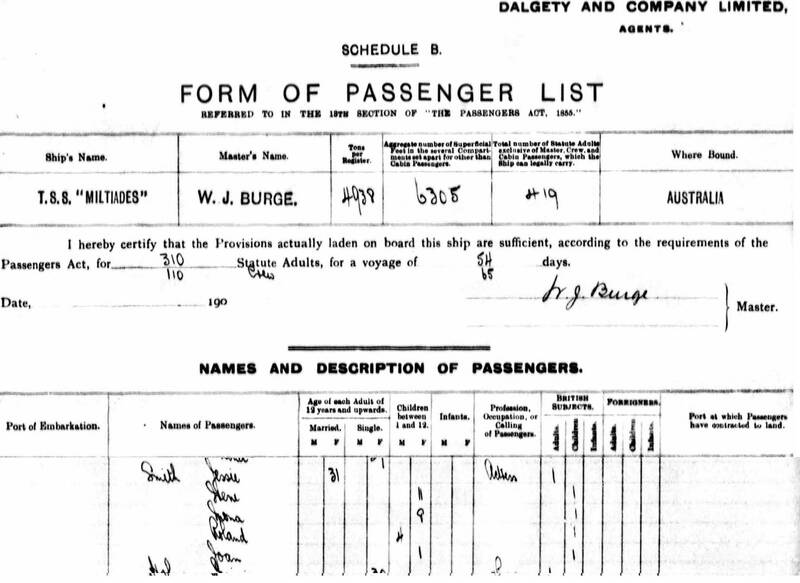 Right: The Australian passenger list for SS Miltiades, arriving 18 April 1914 lists 8-year-old Mona. (This image has been modified to fit). Via the British National Archives and Public Records Office, Victoria, via Ancestry.com. Her parents Phil Smith, a comedian, and Jessie Barlee, a comedian and singer, both had successful careers of their own, sometimes working together on the stage in England, and then for 9 months in Australia. Unfortunately, their professional and personal relationship ended in mid 1915, and a very public divorce followed in 1917-18. In addition, Jessie, still supporting Irene (16), Mona (12), Roland (6) and Joan (5), took Phil to court for child support. Phil Smith disputed this claim, because Jessie and Irene were now on stage and earning money themselves – he claimed. 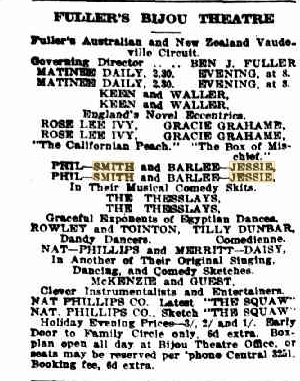 Left: Phil Smith and Jessie Barlee performing at Melbourne’s Bijou Theatre, The Herald 29 April 1915. 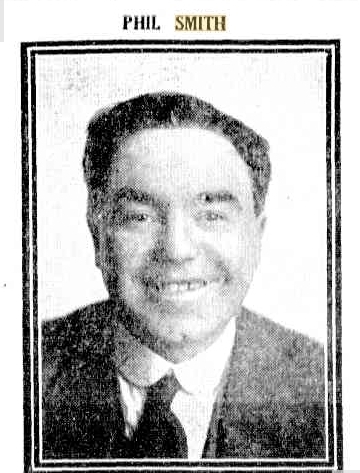 Centre: Phil Smith, The Sydney Mirror, 25 October 1918. Right: Irene (later Rene) Barlee, Western Mail 22 Feb, 1923. Via the National Library of Australia’s Trove. It’s actually Mona’s older sister, Irene Barlee Smith, stage name Rene Barlee, who first earned a name for herself on stage. In 1920 she was described as one of “J. C. Williamson’s latest finds in soubrettes.” She appeared in various touring shows – such as The Midnight Frolics, and in popular pantomimes including Little Red Riding Hood and The Forty Thieves. In language typical of the time, newspapers generally described her as a good “little singer”, a “clever little dancer”, a “pretty”, “dainty” performer. She consistently received good reviews – yet for all her success, Rene decided to leave the stage in 1927 after marrying Murray Church, a Shell Oil Company executive who lived in Western Australia. We are fortunate in that Frank van Straten interviewed Rene in the 1970s. A short extract appears in Van Straten’s sumptuous book, Tivoli. Mona Barlee first appeared on stage at the age of 16, in 1922, in the chorus of “The Merry Widow” at Melbourne’s Her Majesty’s Theatre. (As theatre historian Clay Djubal notes, this is another reason for believing her birth was in 1906. Had she been born in 1909, she would have been performing at the unlikely age of 13). Within a few years Mona was appearing as a featured supporting player. In late 1925, she took the lead role in Jerome Kern, P.G Wodehouse and Guy Martin’s musical “Leave it to Jane” – for J.C. Williamson’s, and although the first Melbourne reviewer in Table Talk felt she was rather “too lightweight”, after six months touring, the Adelaide Mail was able to comment on her “delightful soprano voice and a personality which impresses the audience.” She went on to perform in the Australian run of George and Ira Gershwin, Desmond Carter and B. G. De Sylva’s brand new musical “Tell Me More”. Above: Mona Barlee and Freddy Mackay in “Tell Me More”. The Australasian 31 July 1926. Via National Library of Australia’s Trove. Mona married Charles Harold “Bob” Rayson in Melbourne, in August 1928. She did not retire from the stage as some accounts claimed, but the marriage was short-lived and less than three years later a divorce was granted. Mona Barrie on stage in Noel Coward’s “Hay Fever” at Adelaide’s Theatre Royal in 1931 – in company with other well known Australians; amongst them some familiar names – Cecil Kellaway, Mary MacGregor , Coral Brown and John Wood. The News (Adelaide) 21 August, 1931. Via National Library of Australia’s Trove. In 1932, Mona had a small part in her first film – “His Royal Highness,” a musical comedy made in Melbourne by F.W. Thring and written by and starring popular comedian George Wallace. Film historians Andrew Pike and Ross Cooper describe some of the scenes as “heavy handed”, being influenced by Wallace’s experiences as a stage performer. Eventually the film was sold for distribution in England under the modified title “His Loyal Highness.” This writer regrets to admit that on viewing the film, Mona Barlee’s bit part is so minor, he was not certain he could confidently recognise her. By 1933, reviews of Mona’s stage performances were generally very positive. Eight years after that first ambivalent review, the Melbourne Herald was effusive in its praise for her in “While Parents Sleep“, a new comedy by Anthony Kimmins. Under the heading “Mona Barlee has a future”, the reviewer wrote “Her performance was largely responsible for the play’s success… She has fine talents as a player of sophisticated parts, and this performance should leave no doubt about her future, either here or abroad.” The Western Mail in Perth was even more effusive, writing; “She has worked hard, and, backed by brains, ability, and personal attractiveness, she will undoubtedly be added to the list of Australians who have won world fame.” Indeed, Mona was apparently thinking along similar lines. Years later, when she met Australian portrait artist Stanley Parker again, he recalled they used to “drink cocoa in her little flat in Collins Street [in central Melbourne] and talk about coming to London”. In the height of the Great Depression, that had hit Australia so hard, perhaps the idea of moving country had an even greater attraction. By February 1933 she had her passport and at the end of May she wrapped up her Sydney season of “While Parent’s Sleep”, and boarded the Monterey. She never came back. John Wood, Agnes Doyle and Mona Barlee in “While Parents Sleep”, Table Talk, Jan 26, 1933. Wood left for England and Mona for the US soon after. Via National Library of Australia’s Trove. Mona’s success in the US has been documented, although again somewhat indifferently. She was not tall as has often been claimed, the very thorough US immigration documents kept for new arrivals record that she was only 5 foot 2 or 3 inches, or about 1.60 metres, an average height. Her eyes were brown, not blue, as some accounts claim. Where reviews were given of her work, they were consistently positive throughout her two decades of performing in film – and sometimes on the US stage. For example, of the B-film “Strange Fascination,” made in 1952 (it was Mona’s second last film), reviewer Helen Bower said that while the picture was not to her taste, she could forgive director Hugo Haas a great deal for casting the wonderful Mona Barrie as Mrs Fowler. She stood out “like a Cartier creation amid a heap of junk jewelry. She is authentically a lady… How’s for Hollywood giving Mona Barrie a better break?” she asked. Hollywood didn’t. And her voice? This writer would argue that while it was well spoken it was an unmistakably Australian accent. Unlike so many Australians working in Hollywood, she was an established and skilled actor and was confident in her own ability. She almost certainly felt she didn’t need elocution lessons. And if pressed on her origins she could honestly claim to being English-born, after all. Above: Mona Barrie in a short extract from the Lux Radio Theatre production of “Saturday’s Children“. October 26, 1936. Click to follow the link to the Old Time Radio Downloads Website. Mona Barrie’s final film was in 1953, a bit role in “Plunder of the Sun”, perhaps fittingly directed by the prolific Australian-born director, John Farrow. Of Mona’s family, we know that her mother Jessie Barlee lived to the age of 99. She died in 1979 at her apartment in Melbourne’s St. Kilda. Phil had died in 1946. Roly Barlee, Mona’s younger brother, became a radio announcer and occasional actor in Melbourne. He died in 1988. Mona died aged 58, on 27 June 1964, from unknown causes. She is buried next to her second husband Paul Bolton – they had married in Mexico on December 14, 1933. Of the family’s Australian residences we only know that in the mid 1920s Jessie and her younger children lived comfortably at 6 Faraday Avenue, Rose Bay, in Sydney. The pretty house that was home to this creative family is still there. Ed Lowry, Charlie Foy (Paul M Levitt Ed) (1999) Joe Frisco: Comic, Jazz Dancer, and Railbird. Southern Illinois University Press. Frank Van Straten (2003 ) Tivoli. Thomas C. Lothian, South Melbourne. Clay Djubal (2015) Research notes on Mona Barrie. Australian Variety Theatre Archive. Hal Porter (1965) Stars of Australian Stage and Screen. Rigby Ltd.